Also in attendance was Ronald Blocker, the school’s newest president and chief executive officer who replaced founder Julie Young after her retirement in 2014, and chief operating officer, William Gordon. The class of 2015 marked just the third graduation from the school’s full time program and, with almost 500 graduating seniors collectively, was the largest thus far, according to the program’s principal, Katie Santana. During the event, Kiara Bodnieks, Beau Harrison, Noah Schnacky, Robert Tonic and Daniella Dellisanti, the five students with the program’s highest grade point averages, were honored by sitting on the stage during the ceremony. Harrison addressed the audience with opening remarks, followed by Bodnieks, who led the Pledge of Allegiance. Student, musician and actor, Schnacky, sang the National Anthem at the event. Taylour Farnsworth and April Alzamora, who were part of the graduating class, also spoke. The program’s senior class sponsor, Jessica Middleton, hosted the senior class tribute. In her speech, Middleton spoke about historical, sports, cultural and entertainment statistics from 1997, the year the graduates were born. Middleton went on to share the accomplishments of the program’s graduating seniors, highlighting those who participated in acting, sports, entrepreneurship and high academic honors. Many of the speakers from the event emphasized the fact that, for many of the students, this was the first time they came face to face with their instructors. This post was written by Florida Virtual School student Lauren Mackey. Lauren is the news editor of News in a Click, the FLVS student newspaper. 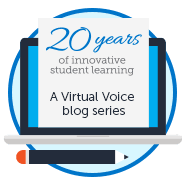 This entry was posted in Full Time Edition and tagged Achievements, Class of 2015, Florida Virtual School Full Time, FLVS FT, FLVS Full Time, Graduation, Student Achievement, Student Spotlight, Student Success on June 22, 2015 by Guest Blogger. 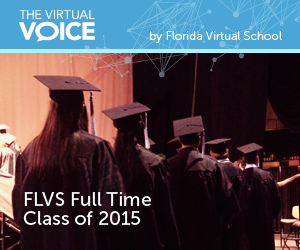 Is there a prom for FLVS full time students? Another question I had was about awards. I know seniors get a ceremony, but do underclassmen still qualify for awards like the Presidential Excellence Award (I know brick and mortar schools do, elementary-high school). If not is it possible for FLVS to start. While FLVS FT doesn’t organize a prom, the school does host a Grad Bash event every spring, so be sure to watch for info about that! As for awards, students are eligible for the same awards as any full-time public school students. Feel free to reach out to your teachers for more information and they can help point you in the right direction. 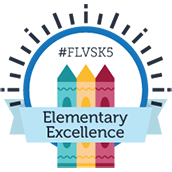 Are there class rings for seniors for flvs full time students? I thought I saw an advertisement but now I can’t find information about buying a class ring. Hi Ashley! Yes, FLVS FT students can purchase class rings. Information is sent to students during their junior year and they are available for purchase through Jostens.